On November 13th, Deputy Cory Curtner served a bond revocation on Phillip Williams of Benton. On November 14th at approximately 12:11am, Sergeant Tim Reynolds and Deputy Dennis Lewis responded to Beal Road in reference to a male running down Beal Road screaming. Upon arrival Deputies found the subject inside a home. It was apparent that the man had broken into the house and was laying in a bed unconscious. The man did not cooperate so he was arrested and booked without a name until Deputy Jailers identified him this morning. Larry M. Edwards of Benton was arrested and charged with Burglary 2nd Degree, Criminal Mischief 2nd Degree, and Disorderly Conduct. Captain Matt Hilbrecht served Edwards a warrant this morning after he was identified. The Marshall District Complaint warrant was issued after an investigation by Benton PD into an investigation into vandalism to a vehicle in Wal-Mart parking lot. On November 15th, Deputy Steven Oakley investigated an injury crash on Moors Camp Highway. The crash occurred at Moors Camp Highways intersection with itself ( Where the loop comes back into Moors Camp Highway ). An ATV operated by Tristan Reilley of Gilbertsville pulled on Moors Camp Highway. A vehicle operated by Christopher Downing of Gilbertsville was unable to stop and struck the ATV. Reilley was transported by EMS to Western Baptist Hospital. On November 16th, Captain Matt Hilbrecht arrested a Fugitive From Justice. According to his citation, Earl Anthony Cathey of Hardin turned himself in to the Sheriff’s Office due to a Michigan warrant for failing to pay child support. On November 19th, Sergeant Jason Lane served an Indictment Warrant from the Marshall Circuit Court on Terry L. Rudd of Calvert City. The charges were Sexual Abuse 1st Degree Victim U/12 Years of Age and Persistent Felony Offender II. Sergeant Lane was assisted by Deputy Lofton Rowley. On November 21st, Captain Matt Hilbrecht served a bond revocation on Ildefonso Ruben Arriola of Benton. On November 23rd, Deputy Chris Greenfield responded to a disturbance on Village Road. As a result of the ensuing investigation John Richard Kimberlin of Benton was arrested and charged with Assault 4th Degree. Deputy Greenfield was assisted by Deputy Cory Curtner. On November 24th, Deputy Barry Howell served an Indictment Warrant on David Freeman of Murray. 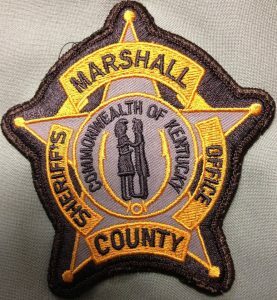 The charges on the Marshall Circuit warrant were for Burglary 2nd Degree, Menacing, Criminal Mischief 3rd Degree, Alcohol Intoxication in a Pubic Place, and Resisting Arrest. On November 24th, Deputy Luke Rudd served a McCracken County Bench Warrant and a Marshall County Bench Warrant on James Roedel of Gilbertsville. The arrest was made at the Sledd Creek Boat Ramp while Deputy Rudd was investigating a trash dumping complaint.